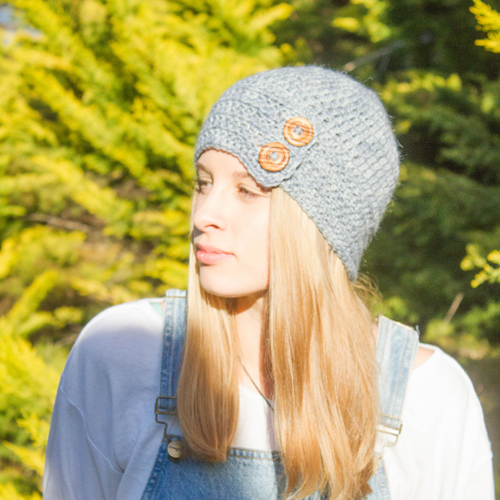 One Tree Beanie - a modern crochet pattern in 5 sizes for all of the family. Classically styled, comfortable and simple to make. Crochet a One Tree Beanie for everyone in the family. 5 sizes included. If you can crochet basic stiches, you can make a One Tree Beanie. This crochet pattern has been tested by independent crocheters (some of their photos are in the gallery). The pattern is instantly available in both standard US terms and Standard UK/AU terms, with step-by-step instructions to help guide your hook to completion. All size options are available in both download files, so choose your terminology and start… make sure you share your results. This is one of my favourite beanies designed by Fi . I have one and two of my grandkids have one . Alpaca is excellent for sensitive skins ( which we didn’t know until one of the grandkids said , “ This beanie doesn’t itch my head “ . It’s such a great pattern to follow and I love how you can individualise it with vintage or handmade ceramic buttons . My other favourite is Fi’s Berries and Cream beanie . Meg, your family are indeed blessed to have you making things for them! I’m so glad you enjoy making the One Tree Beanie; the biggest decision, I find, is often which buttons to use (particularly when there are “Grandma’s buttons” in the stash.